Beyond the clichés of Ikea, Santa Claus, Vikings or blonde girls, Nordic communities have for several generations played a little known role in shaping Canadian life. Through upcoming events, such as the Norway Craft Fair and a Wood Carving workshop on Nov. 1, the Scandinavian Community Centre in B.C. strives to keep Scandinavian culture alive. Judith Anderson, an active member of Scandinavian Dancers of Vancouver (an associate member of the Scandinavian Community Centre) whose great-grandparents came to North America in the 1860s, explains her attachment to her Norwegian roots. Most of the nordic immigration to Canada happened in the same time period as the one to the US, starting in the 1820s as a trickle, then in heavier numbers from the late 1800s through the 1920s, with many more coming after the Second World War. Many of the Norwegian soldiers who trained at Little Norway, the Royal Norwegian Air Force training camp in Canada, met their spouses here and ended up settling in B.C. Some Norwegian immigrants settled in Bella Coola, where in 1894 they were granted homesteads and many of them initiated the first commercial logging, fishing and farming in Bella Coola. “For some reason the large Norwegian settlement in Bella Coola doesn’t seem to get a mention. It could be because they emigrated first to the United States and then as a group to Bella Coola. It was largely Norwegians who built the famous road [Freedom Road],” explains Marian Toft, volunteer at the Norwegian House Society. Coming from similar environmental conditions, Scandinavian people found familiar work opportunities in Canada – forestry, fishing, mining, farming – all things they had done at home. Scandinavia’s influence in Canada comes from the way of life, usually seen as an example through the history. Nordic people share the idea of strong cooperation or working together. “If you look up the names of those who founded Western Canada’s cooperative movements you will see many Scandinavian names among the leadership,” says Carolyn Thauberger, a member of the Scandinavian Community Centre. In artistic areas, Nordic people value simplicity and functionality. “To make your home look more Nordic first throw out most of your stuff then use mainly wood. A Nordic fabric has only two colours. Nordic people are scrupulously honest. None of us will walk across the street against the red light at midnight with no one else in sight. The law is to be obeyed. We have a powerful work ethic,” adds Thauberger. 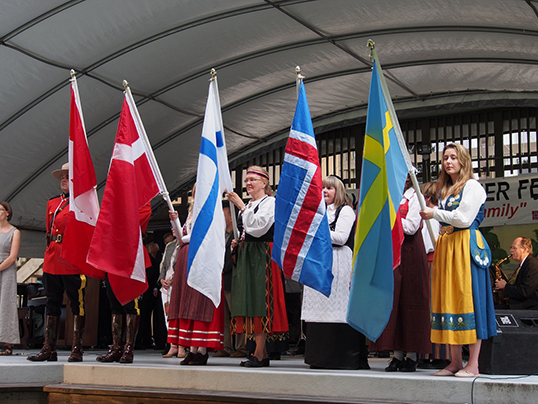 Although the Nordic countries each have their own Society House in Vancouver, the overall “Scandinavian” umbrella is now necessary, and quite positive. In the past, the individual immigrant groups set up their own immigrant organizations here in Vancouver, but numbers and energy have diminished over the years – the number of new immigrants has declined dramatically since the 1950s. The Scandinavian Community Centre is co-owned by the Danish House Society, the Finland House Society, the Norwegian House Society and the Sweden House Society, with the support of associate members, including the Icelandic Canadian Club of British Columbia. “The Scandinavian umbrella definitely makes our group stronger, and in fact it is an amalgamation of older Danish, Norwegian, and Swedish dance groups that all became too small to survive on their own,” Anderson says. For some members it seems difficult to get the younger generation interested in their Scandinavian roots, in general, mostly because it has been a long time since this immigrant community has received infusions of new young people. “However, the third generation is usually more interested. And this is common to almost all immigrant cultures. They join the mainstream culture as quickly as possible. They enjoy Nordic related celebrations, foods, etc., when they can,” explains Anderson. Proof that the interest of Scandinavians in their heritage is far from dead, the Swedish and Finnish communities do have active programs for children at the Scandinavian Centre. A Scandinavian and Baltic program is also offered by UBC and the enrolment numbers have almost tripled since the program began in 2002. Geoffrey Winthrop-Young, undergraduate advisor & department head explains. ← As the world focuses on climate, will Premier Clark remain fixated only on LNG?